Supreme Court Justice Ruth Bader Ginsburg appeared to be wearing her dissent "jabot" on Wednesday —one day after an incredibly divisive and contentious presidential campaign ended in the election of Donald Trump. 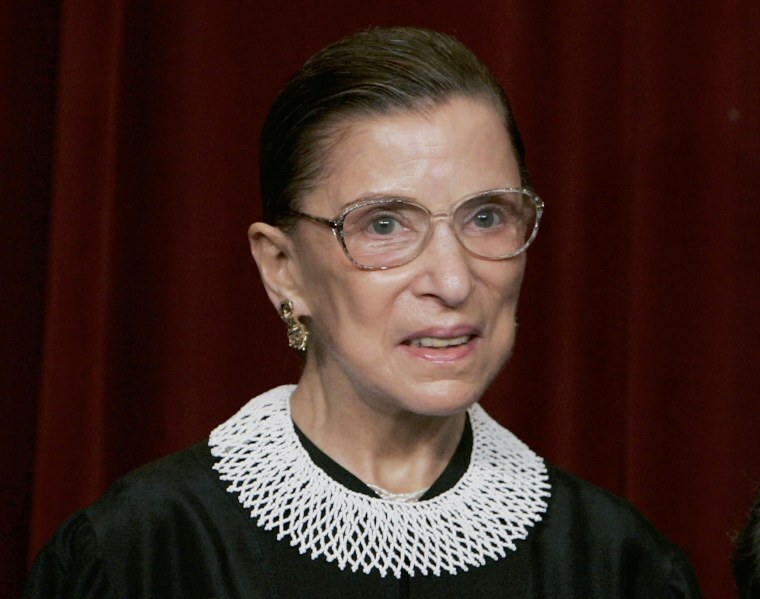 Ginsburg wore the embellished collar ruffle meant to show disagreement and stray from the majority opinion on decisions before the high court. But there were no court decisions slated to go out on Wednesday. The Supreme Court did not return a request from NBC News for comment. Ginsburg has previously been frank on what she thinks of Trump. "I can't imagine what this place would be — I can't imagine what the country would be — with Donald Trump as our president…For the country, it could be four years. For the court, it could be — I don't even want to contemplate that," she told the New York Times in July. She added that Trump was "faker" who "really has an ego" and she would move to New Zealand if he gets elected. When asked by Associated Press reporter Mark Sherman about a Trump victory, Ginsburg said, "I don't want to think about that possibility." Trump hit back at her calling her "inappropriate," "a disgrace to the court," and calling for her to resign. "Her mind is shot" he tweeted. Justice Ginsberg ultimately expressed regret over making those "ill-advised" remarks about Trump during an ongoing campaign. The makeup of the Supreme Court hung in the balance during the high stakes election. Trump will now nominate someone to fill Justice Antonin Scalia's position on the bench. Trump said that any potential Supreme Court Justice should “interpret the Constitution the way the founders wanted it interpreted," he said at a campaign rally in Michigan. “We will save our Second Amendment, which is under siege."